CAPE CANAVERAL, Fla. -- Space shuttle Discovery was moved to the launch pad Thursday to await a launch that could be as early as Dec. 6 _ an effort to avoid potential New Year's Eve computer glitches. The worry is that shuttle computers aren't designed to make the change from the 365th day of the old year to the first day of the new year while in flight. NASA has never had a shuttle in space Dec. 31 or Jan. 1. "We've just never had the computers up and going when we've transitioned from one year to another," said Discovery astronaut Joan Higginbotham. "We're not really sure how they're going to operate." Starting Dec. 6, launch opportunities would be available as late as Dec. 17 or 18. With a 12-day mission, that would mean the shuttle is back on Earth before New Year's Eve. However, NASA was quick to say that even if the shuttle crew finds itself still in space on Jan. 1, procedures could be devised to make a transition if necessary. "Under some weird circumstance ... if we have an 'Oh my god,' and we have to be up there, I am sure we would figure out a way to operate the vehicle safely," said Steve Oswald, a vice president for Boeing Co., the parent company of the builders and designers of NASA's shuttles. "It just wouldn't be flying in the normal certified mode that we are used to flying." If Discovery gets off the ground next month, it will be the third shuttle flight of the year, and only the fourth since the 2003 Columbia disaster. It also will be the first night launch in four years. NASA required daylight launches after Columbia to make sure engineers had clear photos of the shuttle's external fuel tank; falling foam from Columbia's tank damaged its wing, dooming the shuttle and its seven astronauts. 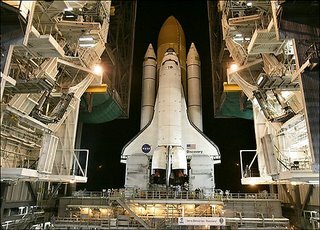 NASA managers believe illumination from the space shuttle's booster rockets should allow for photos at night during the first two minutes, and radar should be able to detect any falling debris. 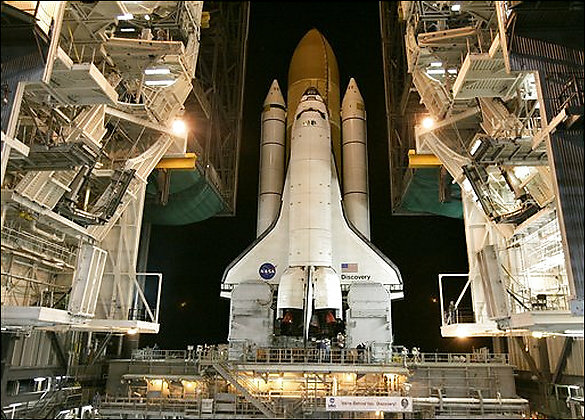 Astronauts also are able to inspect the shuttle for damage while in flight. During the 12-day mission, the astronauts will take three spacewalks to add an $11 million addition to the international space station and rewire the space lab's electrical system. The shuttle will also drop off U.S. astronaut Sunita Williams and bring home German astronaut Thomas Reiter, who has been at the space station since July.